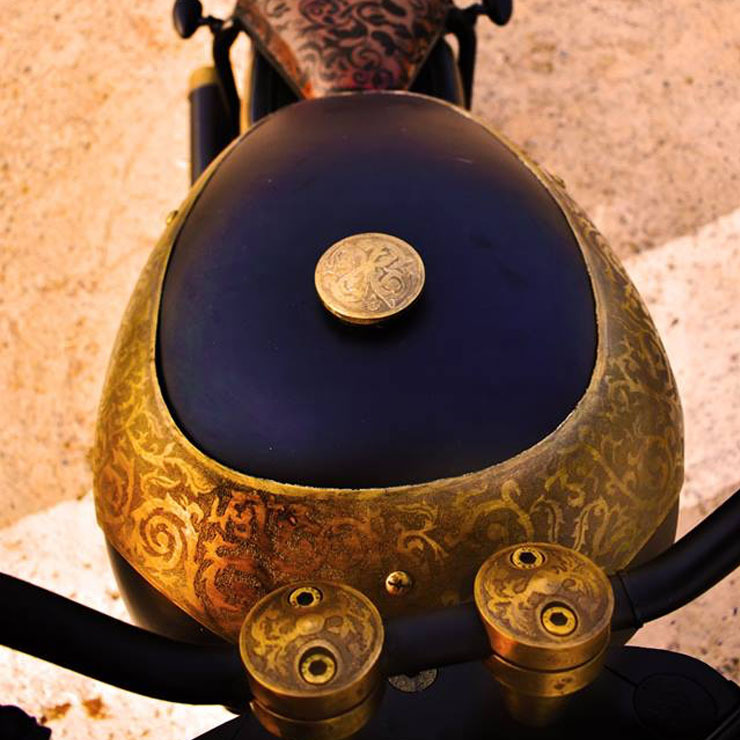 This modified Royal Enfield Thunderbird 350 is a beautiful piece of art! This Royal Enfield Thunderbird 350 Modification is a Delight for Enthusiasts! While most of the modified Royal Enfield motorcycles we have featured on Cartoq have tried to attract eyeballs through their custom body panels, the custom T’bird 350 we have below catches our fancy through the tastefully done artwork its panels carry. 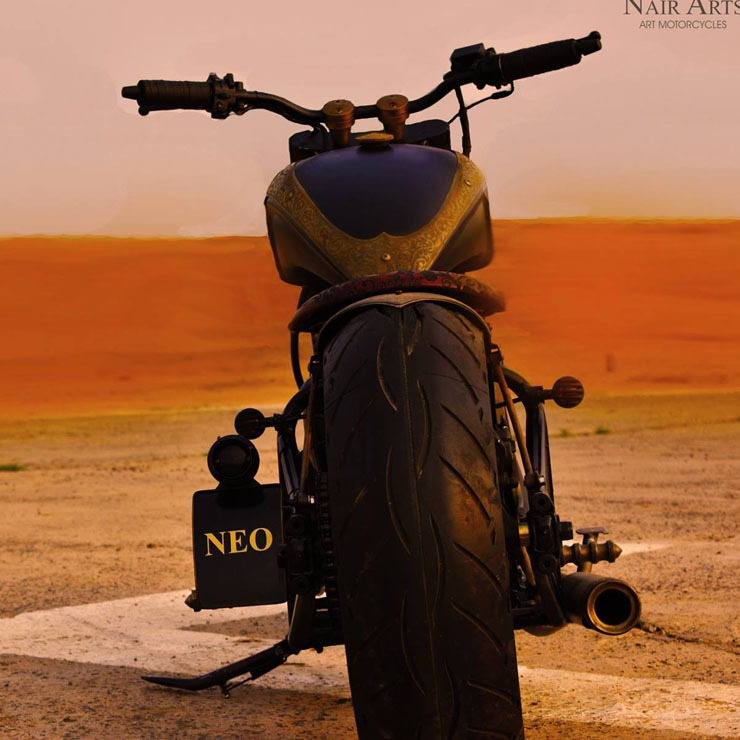 This custom motorcycle is based on a 2004 Royal Enfield Thunderbird 350 and comes from Faridabad-based Nair Arts. It’s been named ‘Neo’. The customizers started working on this motorcycle almost a year ago and spent hundreds of hours to give it the custom-made clothes it sports now. As you can see, the front-end gets a custom conical headlamp along with a beefier set of front forks. Even the front-fender is new. Another highlight is the set of multispoke wheels and the beefier tires. There’s some custom engraving even on the front fender. Moving on, in the side profile, you’ll be quick to notice the custom-made fuel tank, the single-seat arrangement, absence of the stock rear shock absorbers, and the new exhaust pipe. A large portion of the fuel tank gets the high-quality artwork that makes this motorcycle stand out. Even the new side boxes, which can be found positioned below the new seat, get this artwork. The engraving can be found even on the tops of the rear fender and the end-can. The rear-end styling is characterized by a really wide tire and a side-mount for the registration plate. Other highlights of this modified Royal Enfield Thunderbird 350 include an extended wheelbase, a black-painted engine, and a custom air filter. The stock RE T’bird 350 gets a 346cc, single-cylinder engine that outputs 19.8 bhp and 28 Nm. The engine comes mated to a five-speed transmission. « Maruti Zen may return: Here is how!